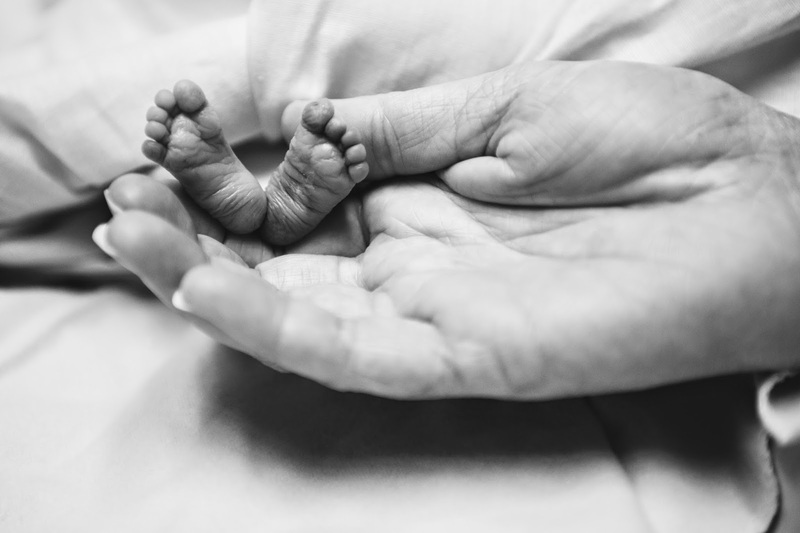 Just added Huntersville mom Lisa Simonsen spearheaded an inaugural Toy Drive (Levine Children's Hospital) and fundraiser (Down Syndrome Association of Greater Charlotte) in memory of her preemie son, Carter, who died on Dec. 31, 2013. 6 p.m. Sycamore Brewing, 2161 Hawkins St. 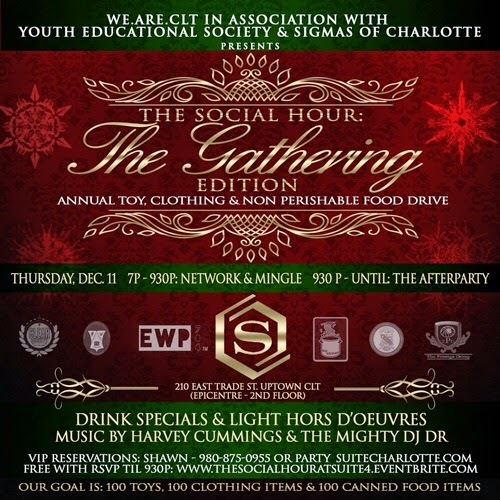 The Social Hour: The Gathering Edition presents its annual toy, clothing and perishable food drive. The goal is to collect 100 items of each. Music by Harvey Cummings. 7 - 9:30 p.m. networking, afterparty: 9:30 p.m, Suite Charlotte, EpiCentre. 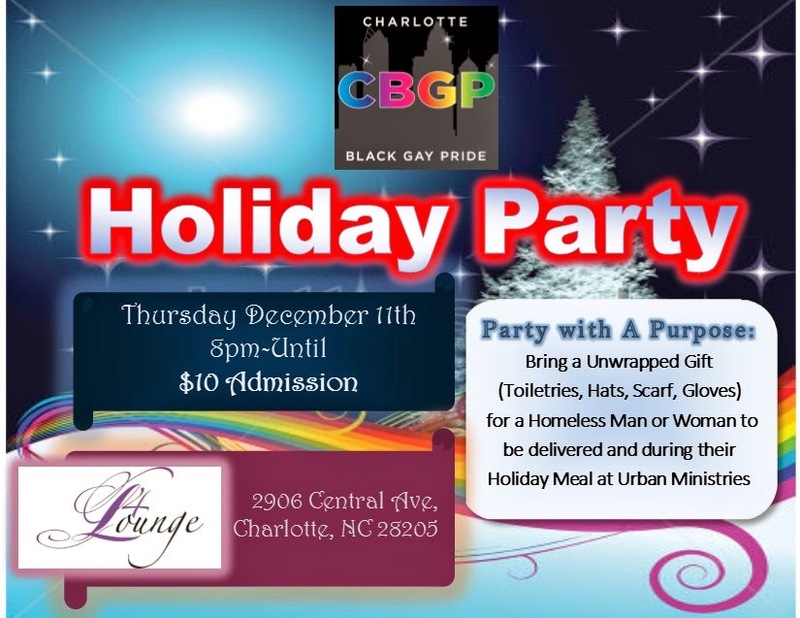 Just addedBlack Gay Pride Holiday Party is taking donations to Urban Ministries. Bring warm weather items for homeless men and women. 8 p.m. L4 nightclub, 2906 Central Avenue. $10. 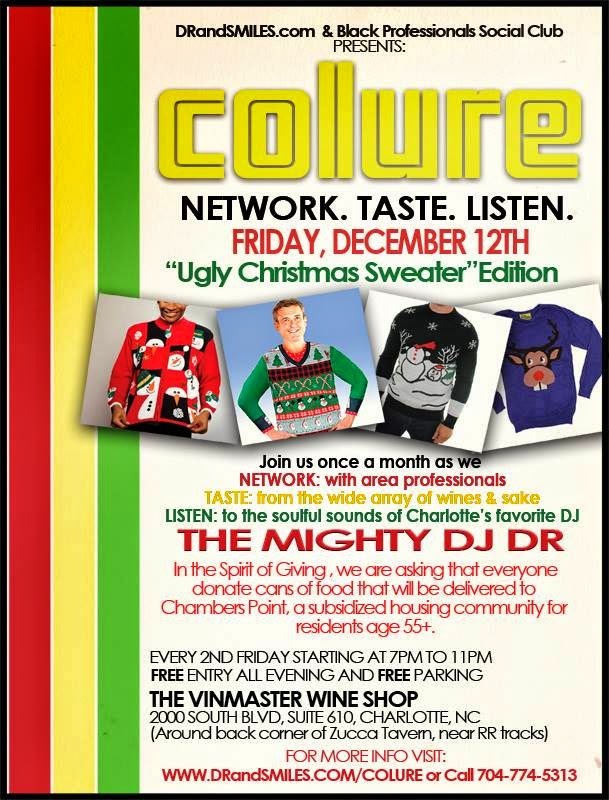 is the holiday version of DJ DR's monthly networking event. Free admission, but bring canned goods to donate. 7 p.m. The Vinmaster, 2000 South Boulevard, Ste. 610 (behind Luna's). Free parking. 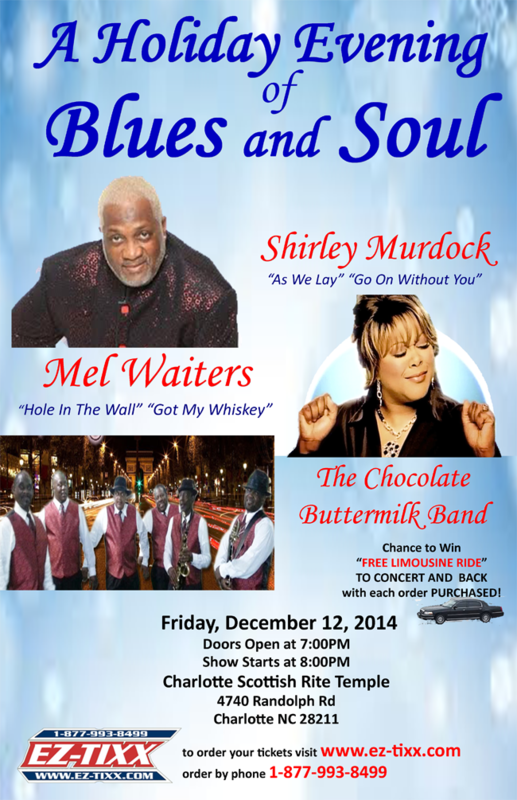 A Holiday Evening of Blues and Soul features bluesy singer Mel Waiters and soul singer Shirley Murdock ringing in the holidays. 7 p.m. Charlotte Scottish Rite Temple, 4740 Randolph Road. Tickets $35 and up. Just added Good Eats and Meets: Good Eats Good Cheer-Good Cause Enjoy delicious apps and drink specials at this holiday party. 9 p.m. Chima Brazillian Steakhouse, 139 S. Tryon St., 139 S. Tryon St. $20 and a donate a toy valued at $20 or more. Series, which is an honor Benoit held in 2011. 8 p.m. Halton Theater, Central Piedmont Community College. $45 and up. 15th Annual Santa Bar Crawl means a whole bunch of bad Santas will take over uptown for this yearly tradition. This crawl winds along Fifth Street and the EpiCentre. Get the full schedule here. Starts at 2 p.m. Please line up a designated driver or a safe ride home. 60th Annual Singing Christmas Tree is comprised of performers, puppets and dancers. WFAE's Mike Collins will host this two-night show. Various times and days. There's also a Singing Christmas Tree For Kids. Details about both shows. Ovens Auditorium, 2700 E Independence Blvd. $21-$35. 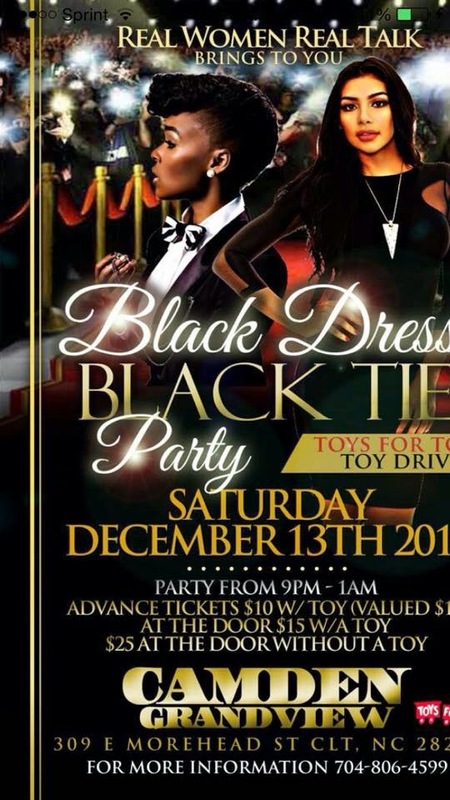 Black Dress Black Tie is a Toys for Tots toy drive party. 9 p.m. Camden Grandview, 309 E. Morehead St. $10 and up w/ toy. 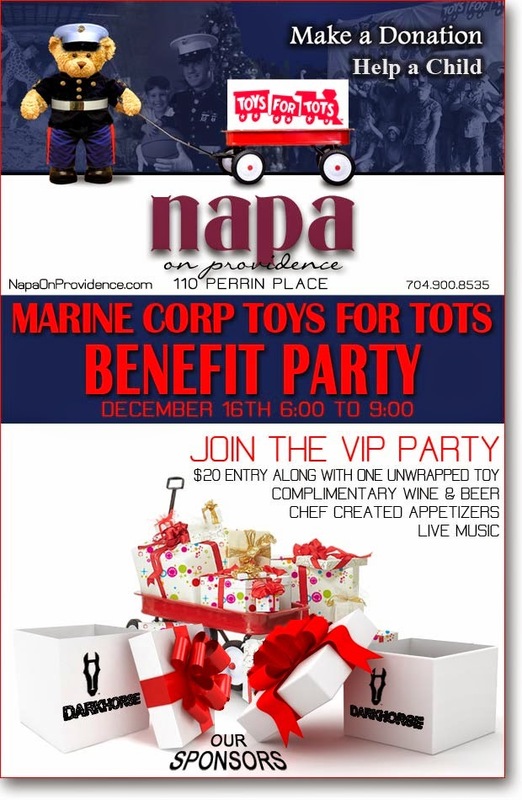 Marine Corp Toys For Tots is as much a tradition as Santa Bar crawls and singing Christmas trees. Don't miss this annual fundraiser. 6 - 9 p.m. Napa On Providence, 110 Perrin Place. $20 with one unwrapped gift includes apps and libations. Just added Hops and Shops 2 is a chance to shop with beer, always a good thing. The Boulevard at South End, Small Keys, Jewels by Julia, Pink Social, Bearded Buddha and Beau Outfitters on East Blvd will be participating. Papi Queso food truck will be onsite for your grub needs. 5-8 p.m., Triple C Brewing Co., 2900 Griffith. The brewery will unveil a batch of 3C Imperial IPA with honey.